Pics and Kicks: today's the day. the sun is shining. . .
the tank is clean. . ."
. . . and I am officially a MOM. :) Ha! Nemo, you are so cool. but seriously, today's the day. Envision | Seattle is T.O.D.A.Y! I do have a tiny tiny tiny bit of space for the UT workshop on the 13th. The workshop in UT will be taught with bestie Jon. I could do this 4 billion times. GOOD LUCK, Natalie! You'll be magnificent. Of that, I have no doubt! My friend recently shared your blog with me, and I just wanted to say THANK YOU for all of the wonderful photography tips! I am adding your link to my blog right now! I am so very excited for Calgary. I can't wait! Good Luck with Seattle! Good luck...I am so looking forward for Utah! 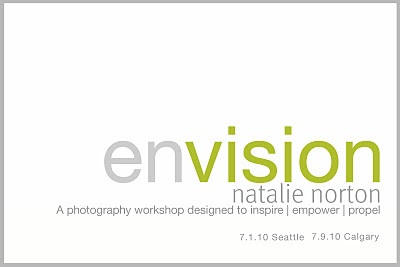 How about coming to Aus for a workshop :) Best of Luck Natalie you be brillant, all those lucky people! hope it was wonderful! i am certain it was. Loved it. Love you. I wish I could do it all over again. Thank you. Natalie the workshop was amazing, You've inspired me and lit a fire that will not die. Thank you so much. You are such an incredible person, artist, mother and wife. Thanks for all the great info yesterday!! everyone else-- Take this workshop!! Oh how I wish I could afford to come up north to your workshop!! It's just not in the budget! Have a great time!! You'll rock them all, I'm sure! !